There are two events to participate in - 2K Family Fun Run and 5K Beach Run! Run one or both - your choice. All ages are welcome. Both races start and end near the entrance of the OB Oktoberfest Beer Garden in the OB Pier parking lot. The 5K OB Brat Trot Beach Run runs along the beach from the OB Pier to the river channel and back. The 5th Annual 2K Family Fun Run will also be run on the beach and is a fun family event. Costumes are highly encouraged! Dust off your lederhosen and yodel down the beach with your favorite hot dog! This annual event is sponsored by the Ocean Beach Community Foundation. 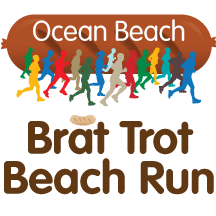 All OB Brat Trot Beach Run Proceeds to Benefit Local Youth Sports. Check in is 8:30 am. Race Time is 9 am. Trophy for 1st place family. Families must finish together. Check-in at 9:30 am. Start Time 10 am. Trophy for 1st place runner. 5K BONUS: Racers - bring a friend before 11am and your friend gets free admission into the OB Oktoberfest Beer Garden!